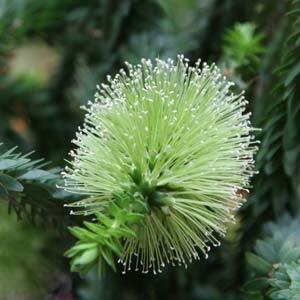 A wonderful green flowering plant, Melaleuca diosmifolia is a fascinating green ‘bottlebrush’ type flower, it should be a real star in the garden. The green flowers are the main attraction and along with the foliage, they do look great as cut flowers as well. An excellent plant for attracting birds and bees to the garden, the common name is ‘Green Honey Myrtle’. With a very dense growth habit and a fairly fast growth rate Melaleuca diosmifolia is well suited as a screening plant. Perticularly suited to this use in coastal situations. If you are looking for other native plants with green flowers, you could consider, Callistemon pinifolius – The Green Bottlebrush. Spread – Generally 2 – 4 metres depending on soil, climate and pruning. Flowers – Lime green ‘Bottle Brush’ shape. Foliage – Small leafed mid green. Frost tolerant – Very mild frosts only, which id typical of coastal plants. Originally from southern coastal areas of Western Australia Melaleuca diosmifolia is a fascinating green flowering species. It is a vigorous species, dense growing and spreads easily. However Melaleuca diosmifolia does have its problems if not kept under control. In the garden, given a little room and some pruning it presents few problems. In the wild, with its fast growing nature, it has a tendency to decrease the diversity of local species and increases fire load if it ‘escapes’ the garden into bush or coastal areas.